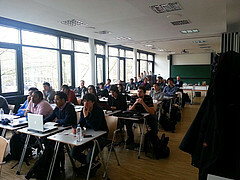 Workshop on "Online Models for Quality-of-Service and Resource Management" organized by the Descartes Research Group. 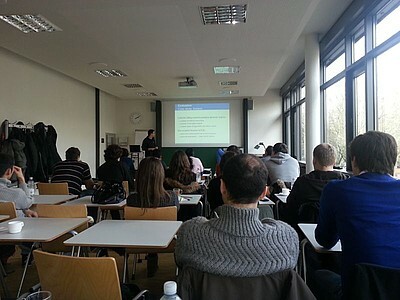 A workshop on "Online Models for Quality-of-Service and Resource Management in Modern IT Systems" organized by the Descartes Research Group as part of the FP7 Marie Curie ITN project "RELATE" took place on December 4th at KIT in Karlsruhe. The workshop included an invited presentation by Prof. Dr. Walter Binder from the Faculty of Informatics, University of Lugano, Switzerland. The slides from the talks and discussions can be downloaded below. Quality-of-Service (QoS) prediction models are powerful tools to anticipate QoS issues throughout the system lifecycle from the system design-phase to the productive system. However, we argue that there are some fundamental differences between offline and online scenarios for QoS prediction. This leads to different requirements on the underlying QoS abstractions of the system architecture and the respective prediction techniques suitable for use at design-time vs. run-time. For instance, the type and amount of data available as a basis for model parameterization and calibration are different. In this talk, we summarize the main differences in terms of goals and underlying assumptions driving the evolution of design-time vs. run-time models. Modern service-oriented enterprise systems have increasingly complex and dynamic loosely-coupled architectures that often exhibit poor performance and resource efficiency and have high operating costs. This is due to the inability to predict at run-time the effect of dynamic changes in the system environment and adapt the system configuration accordingly. Architecture-level performance models provide a powerful tool for performance prediction, however, current approaches to modeling the context of software components are not suitable for use at run-time. In this talk, we present typical online performance prediction scenarios and propose a performance meta-model for i) expressing and resolving parameter and context dependencies and ii) modeling service abstractions at different levels of granularity. The presented meta-model is a subset of the Descartes Meta-Model (DMM) for online performance prediction, specifically designed for use in online scenarios. Dynamic program analysis tools support numerous software engineering tasks, including profiling, debugging, and reverse engineering. Prevailing techniques for building dynamic analysis tools are based on low-level abstractions that make tool development tedious, error-prone, and expensive. In this talk I present DiSL, a new domain-specific language for bytecode instrumentation. DiSL is inspired by concepts from Aspect-Oriented Programming (AOP), features an open join-point model, novel constructs inspired by staged execution, and access to custom static and dynamic context information. Moreover, DiSL guarantees complete bytecode coverage. We have implemented many dynamic analysis tools in DiSL, including profilers, debuggers, testing tools, and workload characterization tools. The DiSL implementations are concise and perform equally well as implementations using low-level techniques. Walter Binder is Associate Professor at the Faculty of Informatics, University of Lugano, Switzerland. He holds a MSc., a PhD., and a Venia Docendi from the Vienna University of Technology, Austria. Before joining the University of Lugano, he was a senior researcher at the Artificial Intelligence Laboratory, Ecole Polytechnique Fédérale de Lausanne (EPFL), Switzerland. His main research interests are in the area of dynamic program analysis, parallel programming, aspect-oriented pro­gramming, virtual execution environments, and Cloud computing. Modern virtualized system environments usually host diverse applications of different parties and aim at utilizing resources efficiently while ensuring that quality-of-service requirements are continuously satisfied. In such scenarios, complex adaptations to changes in the system environment are still largely performed manually by humans. Over the past decade, autonomic self-adaptation techniques aiming to minimize human intervention have become increasingly popular. However, given that adaptation processes are usually highly system specific, it is a challenge to abstract from system details enabling the reuse of adaptation strategies. This talk presents the part of the Descartes Meta-Model that can be used to describe the resource landscape, the architecture and resource layers of dynamic virtualized data center infrastructures, as well as a modeling language (meta-model) that provides means to describe system adaptation processes at the system architecture level in a generic, human-understandable and reusable way.